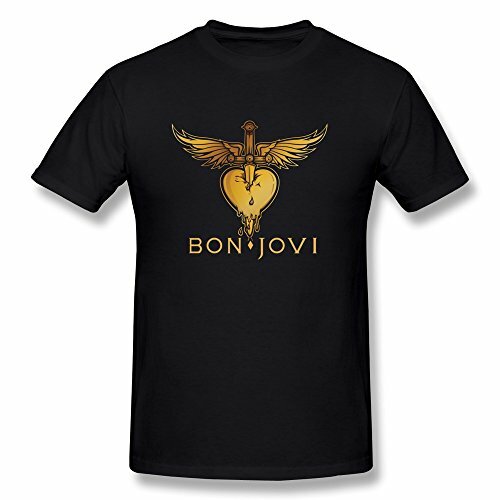 From New Jersey in the U.S., Bon Jovi formed in 1983 and have sold 120 million records worldwide. In the 80s, the band had nine top 40 singles in the UK between 1986 and 1989, from two hit albums, Slippery When Wet and New Jersey. 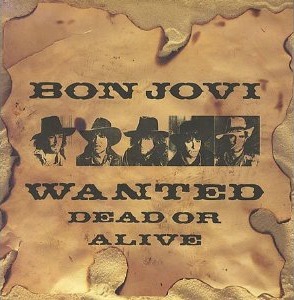 The band members are Jon Bon Jovi (vocals and guitar), Richie Sambora (guitar), Tico Torres (drummer), David Bryan (keyboards) and Hugh McDonald (bass) who unofficially replaced Alec John Such in 1994. The first video (above) is for You Give Love A Bad Name which features footage of the band performing live. 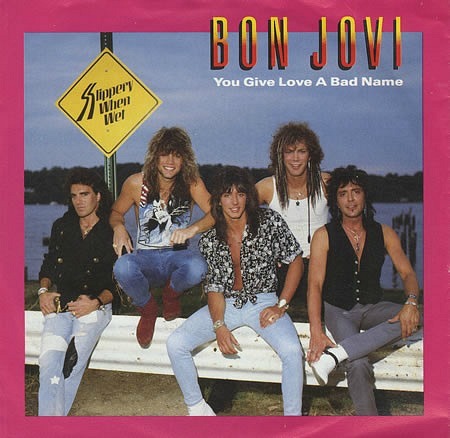 Released in July 1986, this was the lead single from the album Slippery When Wet and gave Bon Jovi their first major hit, topping the Billboard Hot 100 and reaching #14 in the UK. However, in the UK the first single to break into the Top 40 was Only Lonely in 1985 which was lifted from the previous album 7800 Farenheit. The song was released on the Mercury Records label and the B-side included two tracks; Raise Your Hands and Let It Rock. Who else loves the dramatic opening to this song? The glam metal single was a U.S. #1 and peaked at #4 in the UK. It was the second single to be released from the album Slippery When Wet, and was released in October 1986. The tempo was slowed down for the old western style third single from Slippery When Wet. Released in March 1987, the song reached #13 in the UK and #7 in the U.S. It also featured at the start of the 1991 movie Harley Davidson And The Marlboro Man which starred Don Johnson and Mickey Rourke, although received mainly poor reviews by the critics. 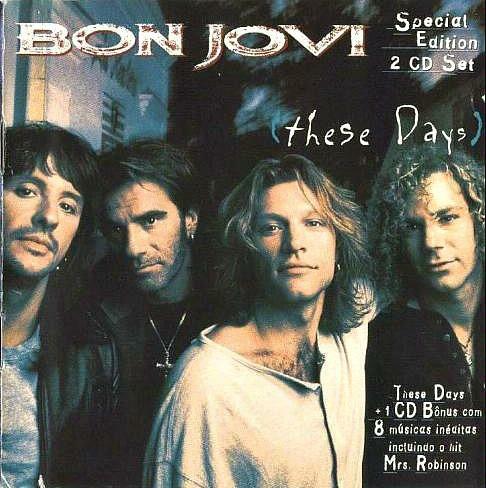 No eighties album is complete without a decent power ballad, and Bon Jovi didn't disappoint with this one. 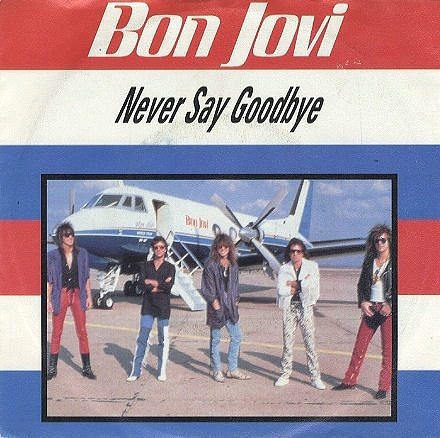 Released in August 1987, Never Say Goodbye was the fourth and final single from Slippery When Wet (it wasn't released as a commercial single in the U.S.) peaking at #21 in the UK. The Irish seemed to appreciate it the most, though, as it reached a more respectable #4 in Ireland. Now, this is a fine video mix which features many (but not all) of Bon Jovi's hit songs. The uploader has stated that he couldn't fit every hit into the mix and the tempo differences just wouldn't allow for all of them. I would have to agree with him that it's far better to leave out songs that are going to ruin the mix. Also, he hasn't messed around with the songs and added any ridiculous effects which is a big positive for me. Here's the track listing - enjoy!